Chocolate manufacturer Nestle is to remove a type of fat linked to heart disease from some confectionary. Hydrogenated vegetable fat and oil - also known as trans fatty acids (TFAs) - have been linked to clogging of the arteries and heart disease. The UK arm of Nestle is removing them from Rolo and Toffee Crisp and possibly other products. "We are reformatting a small number of brands to remove or minimise the hydrogenated vegetable fat content," a Nestle UK spokeswoman said. "We are in the process of removing it from Rolo and Toffee Crisp and investigating how we can remove it from other brands." 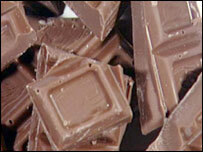 Competitor Cadbury said it too was considering removing the fats from some of its products. "As a responsible company, Cadbury Trebor Bassett has been examining the science behind TFAs in the diet for some time," said Tony Bilsborough, a spokesman for Cadbury Trebor Bassett, the confectionery arm of Cadbury Schweppes in the UK. "Although the evidence is inconclusive, we are aware of rising levels of public concern and are looking at the available options to remove partially hydrogenated fat from the limited number of our products which are a source of TFAs." The hydrogenation process increases the shelf life and flavour stability of foods, but provides no nutritional value. The Food Standards Agency, an independent food safety watchdog, advises people to reduce the amounts of foods containing hydrogenated or saturated fats, as well as reducing the total amount of fat they eat. "Trans fats have no known nutritional benefits and because of the effect they have on blood cholesterol, they increase the risk of coronary heart disease. "Evidence suggests that the effects of trans fats are worse than saturated fats," the FSA says on its website. In the US, hydrogenated vegetable oil has been the subject of warnings by the US National Academy of Sciences and Food and Drug Administration (FDA). Kellogg said on Saturday it was also looking at the issue of TFAs, but said very few of its products contained hydrogenated fats. "We are seeking alternatives to trans fats, which are used in cereals such as Hunny Bs and Chocolate Frosties and Winders fruit snacks," a spokesperson said. "Most breakfast cereals have no fat in them, and those which do have got very low fat. Only a very very small number of our products have hydrogenated fats in them."